`I'he int,ernational Association for Cryptologic Research (IACK) organizes two inter- tioilill coiifcrcnces every year, one in Europe and one in the United States. EUROCRI'PT '89 was the seventh European conference and was held in Houthalen, Belgium on April 10-13, 1989. With close to 300 participants, it was perhaps the largest open conferencr on c:rypt,ogra.phy ever held. 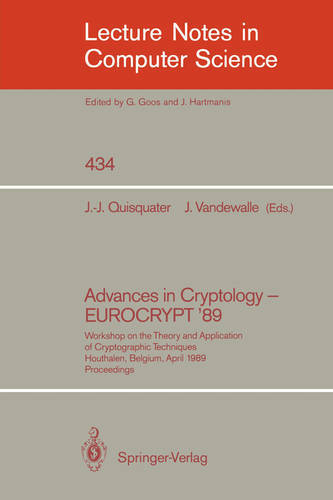 The field of cryptography is expanding not only because of the increased vulnerability of computer systems and networks to a11 increasing range of threats, but also because of t1ic ra.pid progress in cryptographic methods, that t,he readers can witness by reading the book. The present proceedings contain nearly all contributions which were presented including the talks at the rump session. The chapters correspond to the sessions at the conference. It wa5 the first time that a rump session was organized on a Eurocrypt conference. Sixteen impromptu talks were given, and the authors were invited to submit short abstracts of their presentations. Because of the special character of this session, the editors have taken the liberty to shorten some of these.